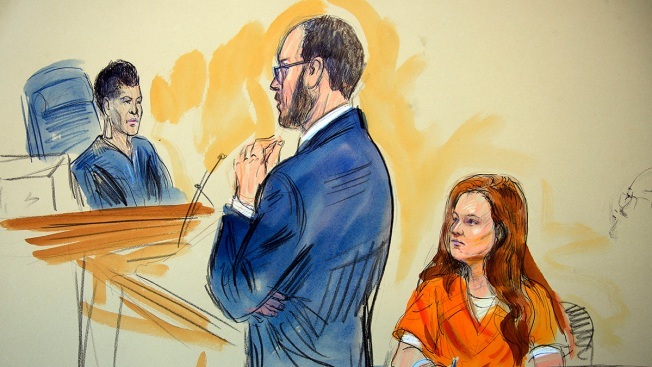 FILE - This courtroom sketch depicts Maria Butina, a 29-year-old gun-rights activist suspected of being a covert Russian agent, listening to Assistant U.S. Attorney Erik Kenerson as he speaks to Judge Deborah Robinson, left, during a hearing in federal court in Washington, July 18, 2018. Attorneys for Maria Butina, the alleged Russian operative facing charges for conspiring to push Moscow's agenda in the U.S., have entered into negotiations with federal prosecutors, according to a document filed in federal court Friday. The two sides asked that the next hearing in the case be postponed because they are currently "in negotiations regarding a potential resolution of this matter," indicating that they are working towards a plea agreement, NBC News reported.